People across the US send a clear message: We demand bold climate action now! The Trump administration and its corporate cronies are doing their best to gut federal environmental protections and by doing so, they are paving the way for transnational corporations to reap huge profits. From appointing former Exxon Mobil CEO Rex Tillerson as secretary of state to attacking Obama-era climate policies, Trump’s climate-denying White House is putting our environment — and our lives — in grave danger. When Trump was elected, we knew his oily agenda threatened to derail climate progress around the world — and that we had a role to play in showing that people from all walks of life in the U.S. care about climate change and are demanding action. 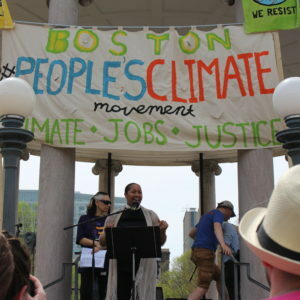 We also knew that hundreds of organizations, led by the likes of Indigenous Environmental Network, 350.org, Color of Change, and many others, were joining together to convene the People’s Climate Movement in the spring. It had the potential to be the most inclusive and intersectional national climate mobilization in the United States. So, we jumped in to help ensure this moment would catapult the climate movement into a fierce new phase of organizing that would hold fossil fuel corporations accountable for their role in our current climate crisis. Members of the Corporate Accountability Action League talked to their neighbors, their friends, members of their churches and political groups, and other grassroots organizations, and organized marches and events across the country. In particular, the Action League played a key role in organizing events in Boston and the Bay Area and ensured that thousands of people took to the streets around the country. We also turned people out for the 200,000-strong march in Washington, D.C. for climate justice. At the end of the day on April 29, 2017, the message was loud and clear: No matter who is in the White House, the people in the U.S. demand climate justice, bold action, and an end to the power and influence of the fossil fuel industry. This demonstration of people power bolstered international meetings on the U.N. climate treaty that soon followed, where the fossil fuel industry’s conflict of interest took center stage for the first time in history.